Box of hand-picked, ready-to-try science experiments and activities for kids K-4 delivered monthly, to feed their imagination while making for a quality family experience. Pre-care and After-care hours are available. TndrBOX Wacky Science Camp encourages kids to discover the magic of science with interactive, messy, and hands-on fun. Workshops include activities such as exploring polymer substances, building your own musical instruments to study sound and vibrations, aerodynamics, astronomy and more. Early Bird Registration (before March 22): $235/week, $335/two weeks. Sibling discount $25 off. Calling all Jr. Wacky Scientists for TndrBOX Workshops!! TndrBOX sparks children's curiosity about their world through questions and scientific concepts. 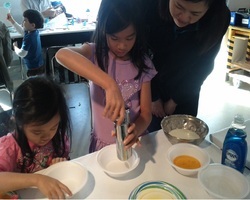 Our customized workshops will feed your child’s imagination, and provide an interactive and engaging experience. Our TndrTreasures (experiments) will help develop critical thinking skills while having a blast with science! 1. Is it a solid? Or liquid? It's Oobleck! What is Dry Ice? 2. What are Sedimentary Rocks? Make your own sandstone! Explore different rock samples. 4. What are vibrations? Make your own noisemaker and examine effects of air on vibrations. Discover “noteworthy” properties of your musical instrument. Contact Raju @ 510-402-7292 or raju@tndrbox.net for pricing and registration options. Maximum of 15 kids and a minimum of 5 kids needed to start each workshop. Each session will be 45 minutes long.